According to Wikipedia, angioplasty was first described in 1964 by Dr. Charles Dotter and successfully used in a clinical setting in 1977 by Dr. Andreas Gruentzig. It was widely seen as a much less invasive and traumatic alternative to bypass surgery. We first regularized collection of data on angioplasties with our 1994 Hospital Discharge Survey , published as Advance Data #278, October 3, 1996. That report gives the number of angioplasties performed in the US short-stay hospitals as 428,000. 2004 Hospital Discharge Survey data, published as Advance Data #371 on May 4, 2006, reflects the increasing popularity of the procedure. In 2004, 664,000 procedures were performed. 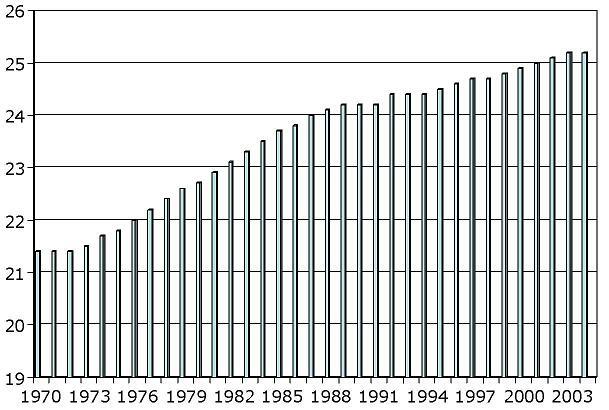 Over time the number of angioplasties have increased. A study in Health Affairs gives more detail on the use of angioplasty. The National Vital Statistics System forms the cornerstone for all US population studies. The system is constantly being improved so as to improve data quality and relevance. The 2003 U.S. Standard Certificate of Live Birth was implented January 1, 2004. Today our Division of Vital Statistics released Expanded Health Data from the New Birth Certificate, 2004. There are some interesting findings on maternal and fetal health, the use of fertility treatments, and methods of delivery. Check it out. Every week the NCHS contributes a feathure called QuickStats to the CDC professional journal Morbidity and Mortality Weekly Report (MMWR). For the week of April 6, 2007 the feature was entitled Percentage Change in Death Rates for the Leading Causes of Unintentional Injury, by Mechanism of Injury — United States, 1999–2004. During 1999–2004, age-adjusted unintentional injury death rates increased 6.8%, from 35.3 per 100,000 population to 37.7. This increase was attributed primarily to increases in rates from motorcycle crashes, poisoning (including unintentional drug overdose), and falls. Similar but smaller increases were observed for these causes in 2003, thus the upward trend continued in 2004. The mean or average age at first birth for the United States in 2004 was 25.2 years, unchanged from 2003. Mean age at first birth for non-Hispanic white, non-Hispanic black, and Hispanic women was unchanged between 2003 and 2004. Mean age at first birth was highest for API women, 28.4 years, and lowest for American Indian or Alaska Native women, 21.8 years. You can view or download our report Mean Age of Mother, 1970-2000 or view/download a table containing the mean age at first birth from 1970 to present. The National Center for Health Statistics provides the “gold standard” for the study of overweight and obesity through the data produced by its National Health and Nutrition Examination Survey (NHANES). Unlike some surveys which are conducted by telephone and rely upon self-reported height/weight information, the NHANES provides height and weight data acquired in a clinical setting. While the telephone survey data are compiled at state and metropolitan statistical area level of detail the NHANES data are only available as national level data. Links to NCHS overweight and obesity data from 1960 through the most recent are located here on the NCHS website. We have recently produced data covering children 0-2 years of age and 2-5 years of age. We are all horrified by the senseless murders at Virginia Tech at Blacksburg, VA. Historically, homicide has been the second leading cause of death among the young people of college agent following unintentional injuries. The CDC provides public use databases for fatal injuries and leading causes of death. As Mother’s Day approaches we get the inevitable question about the number of mothers in the United States. Short answer is that we can’t tell you but the Census Bureau estimates there were 80.5 million mothers in the US. Follow the link to lots more facts on Mother’s Day. You are currently browsing the NCHStats blog archives for April, 2007.